Whenever I went to Yum Cha with my father, he used to order this dish, Fried Noodles with Shredded Pork. 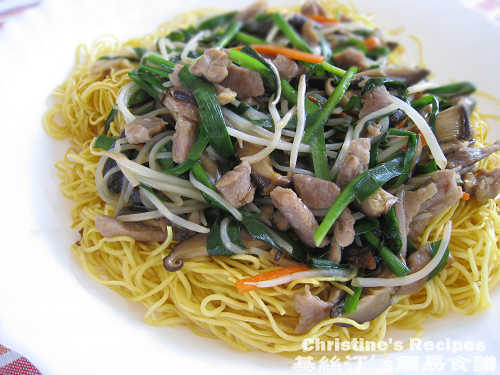 I loved the crispy fried noodles, accompanying with juicy pork and assorted vegetables. This is a very popular Cantonese dish that you still can find it at any Chinese restaurants. The price is not expensive after all. That’s why my father liked to order it to feed us. My hubby loves it too but not the crispy noodles. So I have to adjust the way of cooking it to suit his taste. Use less oil, lower heat, shorter time to fry noodles. Rinse and soak black mushrooms until tender. Slice black mushrooms and combine with seasoning, steam on high heat for 20 minutes with a lid on. Set aside. Trim away the head and root of bean sprouts. Rinse and drain well. Section chives. Cut carrots into long strips. Marinate shredded pork with seasoning for 20 minutes. Blanch noodles in boiling water about 3 to 5 minutes until done, according to the instructions of the packet. Drain well, sprinkle a pinch of salt and a dash of light soy sauce. Mix well with the noodles. Set aside. 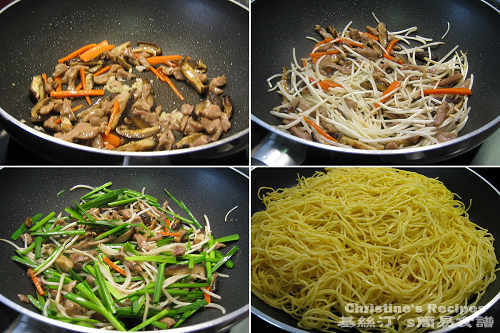 Heat oil in a wok, sauté ginger strips until aromatic. Discard the ginger or let it stay according to your preference. Fry both sides of noodles over high heat until lightly brown. While frying noodles, you don’t need to stir them, just like the way of frying a sunny egg. If you like eating crispy noodles, then add more oil and use higher heat to fry longer time until you’re satisfied with the result. Or you might like to pop them in the oven to bake until crispy. When noodles are done, remove them onto a platter. Heat oil over medium heat. Sauté shredded pork until cooked through. Add black mushrooms, carrots and stir fry for a while. Toss in bean sprouts and cook until tender. Add chives and pour in chicken stock. Bring it to a boil. Add thickening and cook until preferred consistency. Pour over noodles and serve. My mother used to steam marinated black mushrooms. I found this way of cooking mushrooms would add more flavours and tenderness. Before frying noodles, sauté ginger in hot oil. The noodles would absorb all the fragrance and flavour of ginger. This is the secret not to have boring noodles! Although tonight, I bought ingredients to try and make the Baked Pork Chop Fried Rice. Hope it goes well. Also, my friend tried making the Chinese New Year Coconut Pudding. I think she had some trouble as she commented on the bottom of the recipe. Looks delicious -- crispy or not. Is your friend,named Amy. I just posted a reply for her. Sorry for late response. Hope you'll enjoy the Baked Pork Chop Fried Rice. I just made the baked pork chop fried rice and the cheesy top was nice and gooey yet crispy. However, I think the tomato paste was kind of on the more sour side. Is it possible to substitute ketchup? Sure, you can adjust to whatever you like. Cooking is so personal that you can tweak the recipe to suit your taste. Or try to buy a brand of tomato paste that is not too sour. Mine is Leggo's, with balanced taste and beautiful colour. Wow! What a great heap of ingredients on top of the noodles! Guess you must have received 2 thumbs up from your hubby! Yeah, he loves many many veggies and meat going with fried noodles. Yum!!! That looks so good!! I'm so happy to discover your sight. I've been looking for a great fried noodle recipe. My boyfriend loves cantonese/chinese food. 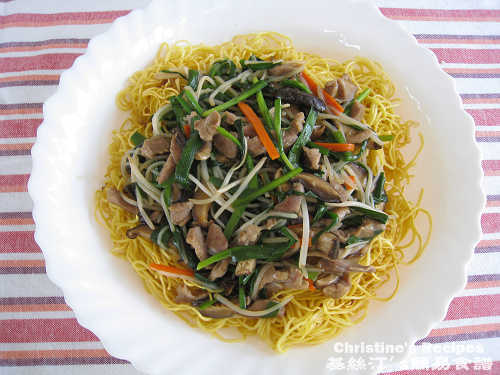 I'l try your fried noodles recipe this weekend. Hope you have a nice weekend enjoying your good foods with you boyfriend. Do you use fresh or dried noodles?